Photo Scanned from Burstall's Simple Working Models of Historic Machines Sketch scanned from Country Furniture, by Aldren A Watson. 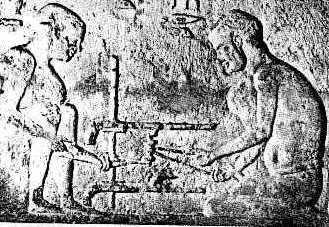 The Egyptian lathe is based on a stone carving which may be the earliest pictoral representation of a lathe. Artifacts as early as the 7th century B.C. have been found which appear to have marks consistant with having been turned. Scanned from Daumas' A History of Technology & Invention Vol. I. 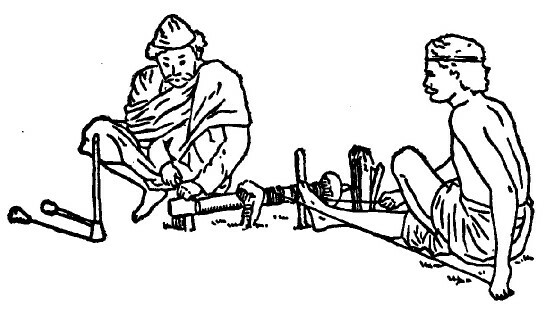 A diagram of a simple Roman-era bow lathe, showing how the head and tail stocks are buried in the ground to hold the set-up steady. Scanned from Country Furniture, by Aldren A Watson. from Alphonso X's "Book of Games," Circa 1280 A.D. As with the Egyption stone carving it is believed that this was actually a horizontal set-up. 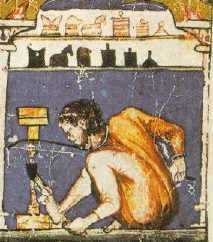 There is no tool rest so the turner is steadying his tool between his toes. There are similar simple lathe that are operated in the same manner which can be seen in third world countries to this day. Another image from Alphonso X's "Book of Games," showing a man turning Backgammon pieces.